Obadiah Benjamin Stevens was born August 1, 1847 to W.J. & Susan M. near the little town of Benevolence. He bears the distinction of having lived in two counties without having moved from his ancestral home. Stevens married Julia A. (Lofton) Stevens on October 16, 1867. Stevens was born and bred a planter, and after he reached mature age, he also engaged in the warehouse and commission business, at which he achieved a marked success, as well as in agricultural pursuits, through his sagacity, industry and perseverance. An 1884 editorial referenced "Tobe" Stevens, as everyone called him, as a man who would make a safe and energetic legislator. 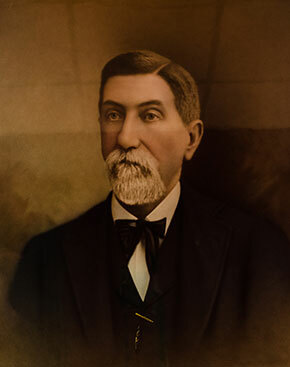 A man of thought and earnestness of purpose, his ability was soon recognized by his fellow citizens, and in 1884 he was elected a member of the Georgia General Assembly as a Representative from Terrell County, and served with distinction for two consecutive terms (1884-1888). In 1896 Stevens was elected State Senator from the 11th District, and served from 1896 and 1897 in that capacity. At the expiration of his term, he decided to run against incumbent Commissioner R.T. Nesbitt of Cobb County. One source commented on his commitment to the race citing, "when Mr. Stevens made up his mind to make the race he applied himself to the task with accustomed vigor and energy, and because of his splendid reputation as a successful planter and sagacious lawmaker, he was nominated in the primary by a large and complimentary majority of Democratic voters." Commissioner Stevens quickly went to the work of the department with "zeal and energy" as to inaugurate such reforms and improvements in the management of the department. Under Stevens, a large and handsomely illustrated volume, entitled, Georgia: Historical and Industrial, was issued by the department in 1901 in response to the growing demand for information concerning the industrial resources and possibilities of Georgia. Being a man well versed in the needs of the farmers, familiar with the cultivation and fertilization of crops, he was able to grasp the necessities of the planters of the State in many ways. Stevens went on to reduce the expenses of the department and increased revenues.